Iceland’s Blue Lagoon has evolved into one of the world’s best-known spas. Would a visit to the island really be complete without soaking in the geothermally heated seawater of the popular spa? The volcanic landscape around the Blue Lagoon makes a dramatic impression. Even under an overcast sky I was tempted to pause the car to photograph plumes steam rising from the vents of the nearby Svartsengi geothermal power plant, which heats the water of the spa. Green moss tops the black stone of the lava field. The water of the Blue Lagoon’s freeform outdoor pool is warm and milky blue. The heated water is rich in minerals that are reputedly good for the skin. A cloud of steam rises into the overcast sky above the Blue Lagoon in Iceland. After stepping out from the changing rooms into the cool air of an autumn day I hung my white bathrobe on one of the outdoor hangers and headed to the pool. I’m not a fan of immersing myself in cold water but had nothing to fear. The air over the pool was misty due to the rising heat of evaporating water. Even if I’d known somebody on the far side of the pool I’d have struggled to recognise them. Submerging myself in the Blue Lagoon was like stepping into a vast bathtub. A sign informed me that the water temperature, where I entered, was 38°C. I could feel the temperature rise and fall as I moved slowly around the pool. Wooden walkways by the edge of the Blue Lagoon. I kept myself submerged from my shoulders down, to maximise my enjoyment of the pool’s heat. Occasionally I’d dip deeper. When my eye level was close to surface of the water I noticed that the volcanic rock was caked in white minerals. After a few minutes in the pool I rubbed my hand over my shoulder and noticed that my skin felt smooth. I popped to the bar and ordered myself a drink while still in the water. It seemed beautifully indulgent to be sipping a cold beer while floating in a warm pool on a Wednesday afternoon. After licking my salty lips, the beer seemed especially refreshing. Beer o’clock in Iceland’s Blue Lagoon. Silica mud masks were also being distributed from a poolside fridge. “You’ll feel 10 years younger,” said the smiling woman who handed to cold, grey-white clay-like lump to me. She explained that I should knead the mud to warm it and apply it after wetting my face. After a few minutes my cheeks and forehead felt silky smooth. 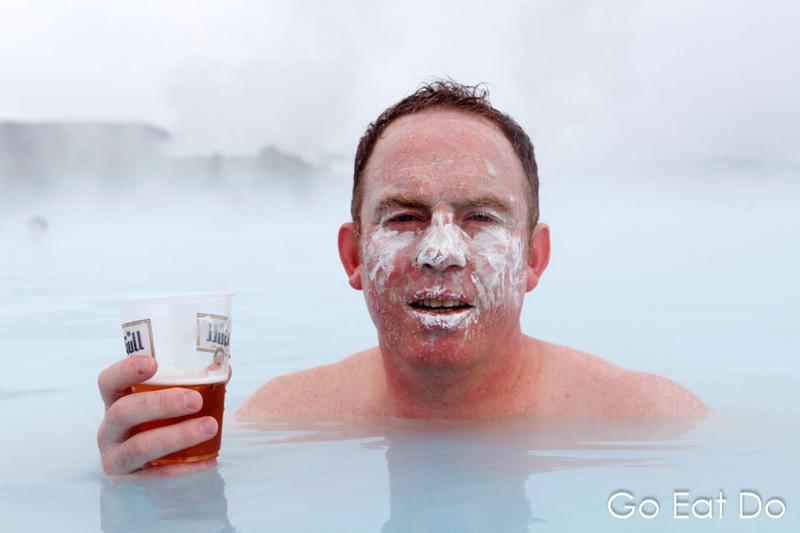 Relaxing with a mud mask and a cold beer at the Blue Lagoon in Iceland. For the next couple of hours I enjoyed relaxing then showered before heading into the Blue Lagoon’s poolside Lava Restaurant. The dining room’s floor-to-ceiling windows offer views onto mounds of dark lava and the pools of the spa. Icelandic cuisine served at the Blue Lagoon’s Lava Restaurant. Lava serves modern Icelandic cuisine. The restaurant provides a chic setting and a relaxed atmosphere. It strikes me as the kind of place that’s ideal for treating a partner to a surprise meal while on the road. In addition to the a la carte options it’s possible to choose two or three courses from the restaurant’s vegetarian, seafood and Icelandic gourmet menus. For my main course I selected grilled Icelandic lamb that, deliciously, was charred on the outside and pink in the middle. It was accompanied by crunchy chickpeas, cubed apple, crispy cabbage and a rich jus. It proved such a pleasant place to while away time that I opted for the cheeseboard before coffee. The cheeseboard at the Blue Lagoon’s Lava Restaurant. The Blue Lagoon warranted the drive out from Iceland’s capital. Spending time in the pool and Lava Restaurant proved an enjoyable and relaxing way of spending an afternoon. Time to go? Wrinkled fingers after a long session of steeping in the Blue Lagoon. See the Blue Lagoon (Norðurljósavegur 9, 240 Grindavík, Iceland; tel. +354 420 8800) website for information about opening times (which vary according to the time of year) and prices. It is necessary to pre-book the time you want to visit. That can be done via the Blue Lagoon website. 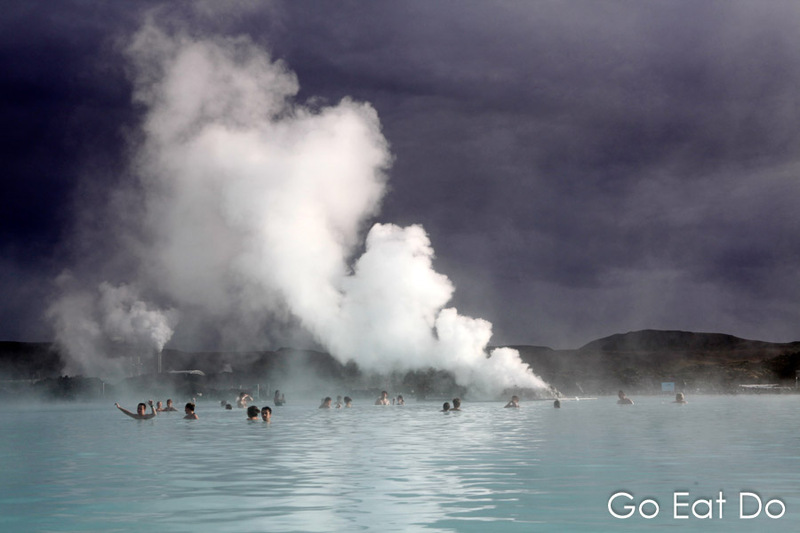 The Blue Lagoon is approximately 40 minutes’ drive from Reykjavik and 15 from Keflavik Airport, the hub of Icelandair. For more ideas about things to do and see in Iceland, take a look at the Inspired by Iceland website. Photographs illustrating this post are by Why Eye Photography, based in northeast England. Commission a shoot by calling 07947 587136 or making contact via the Why Eye Photography website. Stuart Forster, the author of this post, is an award-winning journalist and was named Digital Influencer of the Year at the 2018 Holland Press Awards. Stuart is based in the north-east of England and available for magazine, newspaper and online commissions. Feel free to make contact via this website if you want to commission work or sponsor a post on Go Eat Do. A warm pool on an overcast day. I thought Iceland was a great place to spend time photographing the landscapes. I hired a four wheel drive and had a great time exploring. Haven’t been to Iceland yet, but the Blue Lagoon is on our must-do list when we get there. I love thermal baths. For me it was one of the highlights of visiting Iceland.